Telangana(TS) ITI 3rd Phase Applications, Web Options, Seat Allotment Order 2017 Phase-3 applications from 08-09-2017 to 11-09-2017 Web Allotment Letter @ iti.telangana.gov.in TS ITI Admission 3rd Phase Seats Allotment Orders 2017 Login to print "Provisional Seat Allotment Letter : TS ITI Admission Seat Allotment List 2017- Telangana ITI 1st Phase - 2nd Round - Seats Provisional Allotment Letter Result / Merit List-Seats Allocation @ iti.telangana.gov.in TS ITI Admission 2nd Round fresh Options Telangana(TS) ITI Seat Allotment Result 2017- Merit List Released - Download ITI Seats Allocation result: Telangana ITI NCVT Admission Merit List 2017, 1st & 2nd Round Allotment List @ www.manabadi.com Telangana TS ITI 2017 Result / Merit List / Allotment Telangana(TS) ITI Admissions 2017 Merit List, Seats Allotment Schedule of ITI Admissions: Telangana ITI Courses Online admissions schedule 2017, Telangana ITI Online admissions schedule 2017/ ITI Telangana Online admissions schedule, web options dates for ITI Admissions, Certificates verification dates for ITI admissions/ Merit List generation for ITI admissions, Seats Allotment of ITI Online admissions. Telangana ITI Result 2017 or TS ITI Merit List 2017 or Seat Allotment Result will be declared for Telangana TS ITI Admission 2017. A notification is issued for admissions into 54 Government I.T.I.s and 222 Private I.T.I.s in Telangana State under NCVT pattern. Candidates who have applied for ITI Online Admission 2017 and verified their certificate can check the merit list as per schedule is given below. Get here complete details of Telangana TS ITI 2017 Result. Online Admissions into I.T.I.s: Government have permitted the Director, Employment and Training, Telangana, Hyderabad to make admissions into Government and Private Industrial Training Institutes through online. Accordingly, a notification is issued for admissions into 54 Government I.T.I.s and 222 Private I.T.I.s in Telangana State under NCVT pattern. However, a separate Notification will be issued for the admissions into the remaining 10 Government I.T.I.s under SCVT Pattern later. Principal Radhakrishna, Principal of the College, said that the candidates registered in the Government and private ITIs will be able to verify their original certificates in the State Girls ITI in Khammam with their original certificates online for 2017-18. 3rd Phase Seats Allotted. Login to print "Provisional Seat Allotment Letter". Report at allotted I.T.I. Telangana(TS) ITI Seat Allotment Result 2017- Merit List Released Download ITI Seats Allocation result from here. ITI Seats are Alloted. Login to Print Provisional Allotment Letter: Help Desk contact numbers: 7997973486, 7997973321, 7997973364. Timings 10:00 AM - 6:00 PM. 1. Applications are invited from the eligible candidates for admissions into Government ITIs and Private ITIs in the State through online for the left over seats of 1st and 2ndPhase under NCVT pattern for August-2017 session. 3. Qualification:- Person having educational qualification as 10th Pass / 8th pass can take admission in ITIs. The required minimum qualification is prescribed in the respective trade syllabus, as well as in the list of Trades under Craftsmen Training Scheme (CTS) given in the website. 4. Age:- Candidates who have attained the age of 14 years as on the date of commencement of academic session i.e 1-8-2017 are eligible for admission. There is no upper age limit for candidates seeking admission in course under Craftsmen Training Scheme. 5. The interested candidates have to register themselves in the website and submit their applications through online along with web options in the order of preference of ITI’s and Trades and attend for the verification of certificates at the Verifications centers. Please visit the website for the details of verification centers, Prospectus, Seats Availability, notifications, and guidelines issued from time to time. Seats will be allotted to the candidates who have attended for certificate verifications and paid the verification fee of Rs.10/- in the form of cash. / website about the seat allotment with instructions to report at the concerned ITI. 7. Single online application is adequate to apply for admissions into any of the Government and Private I.T.I.s in Telangana State. Candidates are advised to give more number of options to get the seat. Physical form of application will not be entertained. 8. All the admissions are subject to clarifications / Instructions issued by Government and DGT, New Delhi from time to time. Visit the web portal of Government of Telangana Directorate of Employment and Training at www.iti.telangana.gov.in. As you have already become a registered user during the application process, you need to enter crucial details. Fill in the details such as the mobile number and email id in the relevant fields. The aspirants need to enter the above Captcha Code and login into the website. You will navigate to a new page wherein you need to enter the application number and date of birth in relevant fields. Hit the submit button and send the information that you have entered on the page. In a few seconds, the merit list will display on the screen. The concerned department will notify the applicants regarding the release date of Telangana ITI Admissions 2017 Seat Allotment List. 1. The Provisional Allotment of Trade and I.T.I is intimated to the candidates register mobile and email address. The same information will also be available on the website. Separate Seat Allotment Letter / Intimation Letters will not be sent to the candidates. 3. Candidates shall report at the allotted I.T.I. along with the Provisional Allotment Letter and all original certificates within the prescribed time. 4. The candidate shall also pay the prescribed Tuition Fee of Rs.7700/- per annum, if he is admitted into Private I.T.I. However, if the candidate gets seat in another I.T.I. during the subsequent phases/ spells, the ITI Management shall refund such Tuition fee to the candidate. 5. The candidate shall pay the prescribed Tuition Fee, if he is admitted into IMC quota seat. 7. After completion of the first spell allocation of seats, if vacancies exist, there will be sliding process in allocating such vacant seats basing on the fresh options exercised through online, in subsequent spells. 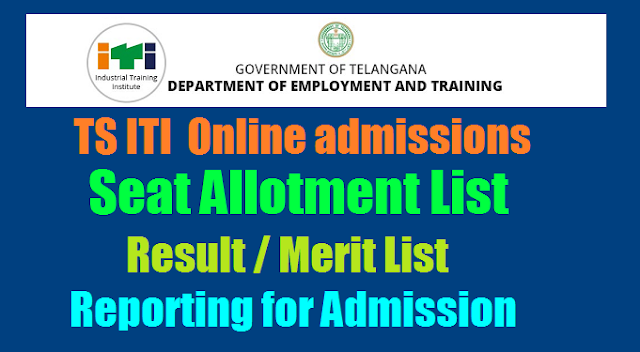 Telangana(TS) ITI Courses Online admissions 2017 notification: TS ITI Courses Online admissions 2017 notification/ Telangana ITI Online admissions 2017/ ITI Telangana Online admissions/ Last date for submission of ITI Online application forms / Seat allotment Letter/ IITI Selection list results and Merit list: Online Admissions into I.T.I.s: Government have permitted the Director, Employment and Training, Telangana, Hyderabad to make admissions into Government and Private Industrial Training Institutes through online. Accordingly, a notification is issued for admissions into 54 Government I.T.I.s and 222 Private I.T.I.s in Telangana State under NCVT pattern. However, a separate Notification will be issued for the admissions into the remaining 10 Government I.T.I.s under SCVT Pattern later. Industrial Training Institutes (I.T.I.s): The Industrial Training Institutes popularly known as I.T.I.s were established to ensure a steady flow of skilled workers in different trades for the domestic industry, to raise the industrial production quantitatively and qualitatively by systematic training, to reduce unemployment among the educated youth by providing the employable training, to cultivate and nurture a technical and industrial attitude in the minds of younger generation. 'D' Block, 4th Floor, BRKR Bhavan, Tankbund Road, Hyderabad 500 063 Telangana State.